This is a demo, limited version, full version can be found here: Heatmap 105. Only a subset of settings are available. Indicator can display 10 symbols maximum. Monthly data are used to calculate percent price change. 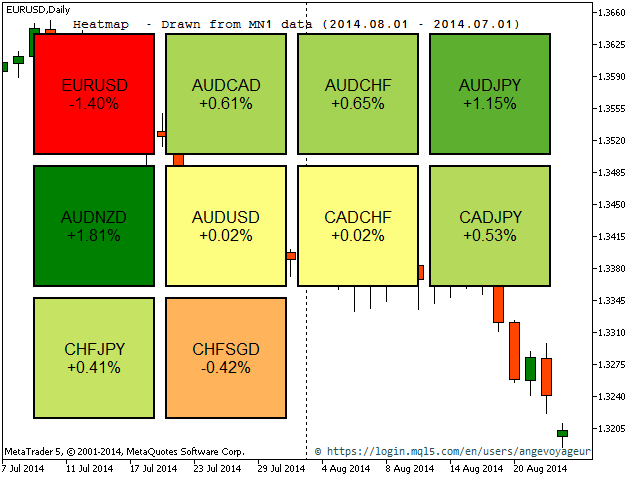 This Heatmap indicator allows you to display a "heatmap" of all symbols selected in the Market Watch. In this version it shows the percent price change in relation to the last daily close, what can give a quick overview of the market. 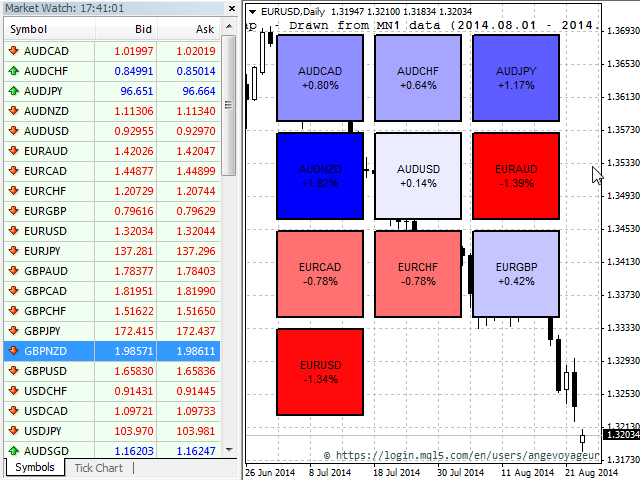 This is a tool to help traders identify how strong is a currency in relation to all other pairs. This is a visual tool, and cannot be used inside Expert Advisors. In this sense, it's more a tool for discretionary traders, instead of automated traders. So, for those interested in using this tool for automated trading, unfortunately this is not possible. Up Color any Color Blue by default. This color is used to indicate the symbols with positive percent change. Mid Color any Color White by default. This is the neutral color, used for symbols with no increase or decrease (0%). Down Color any Color Red by default. The color is used to indicate negative percent change in price. Border color any color Border color of a symbol's panel. 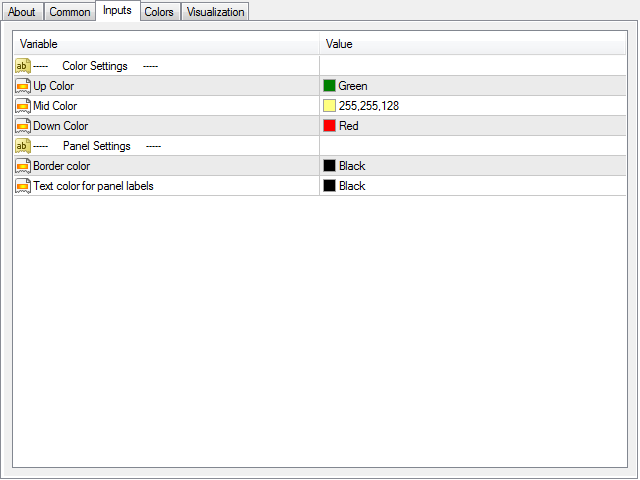 Text color for panel labels (if not auto) any color If previous setting is false, this color will be use for panel's text labels. Maximum allowed symbols is 200. If the Market Watch contains more than 200, only the first 200 will be displayed. Please note that you need sufficient resource (CPU, Memory) on your computer if you want to display a lot of symbols simultaneously. Please contact me if you have any question, remark or suggestion. Good trading.